Pixelmator now works with P3 wide color gamut, so you'll see brighter, more vibrant colors when using the app with the new MacBook Pro or one of the new LG 4K or 5K displays. Most importantly, this version of Pixelmator includes support for the MacBook Pro's Touch Bar. End users won't be able to access Touch Bar features until the first MacBook Pro orders begin arriving next week, but Pixelmator is launching it early. The Touch Bar keeps the most useful Pixelmator tools right at your fingertips for quicker editing and streamlined workflows. It automatically changes based on what you're doing within the app, and it can be customized to suit your individual needs. - Set the most useful tool options for your selected tool right in the Touch Bar. - The Touch Bar is customizable, so you can choose exactly which tools you'd like to keep in it. - Use the Touch Bar to change color, alignment, and other text properties. - When previewing effects or adjustments, a Show Original button lets you take a peek at the original image. - Use Rotate and Scale sliders to transform layers. - And do a lot more! Pixelmator also now includes a new content-aware Smart Refine feature that's designed to make selecting content quicker and more accurate. Smart Refine is able to detect object edges in an image to automatically refine a selection outline. It naturally smooths the edges of a selection for easier blending, and there's a new workflow for making quick edits to a selection through painting. 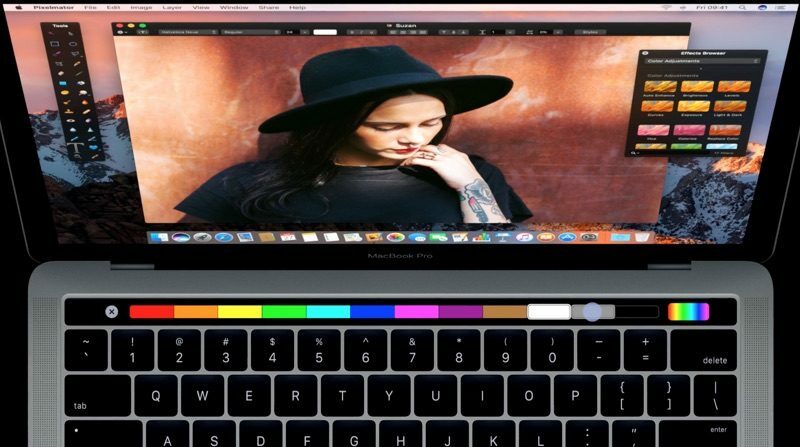 End users won't be able to access Touch Bar features until the first MacBook Pro orders begin arriving next week, but Pixelmator is launching it early. Thank god Apple added the Touch Bar to replace the F keys that nobody ever uses! My favorite app! Glad to see this update go live. Also Affinity Designer just got TouchBar support. Very nice update. Fan for 8 years. I've been using Pixelmator for years. While it is a great app and well worth the money, one thing has always bugged me. I hate the floating tool palettes. I've been wishing for an update that would give users the option to have fixed palettes on the sides. Getting tired of waiting for it. More tempted than ever to give Affinity Photo a try. Speak for yourself. I use darker/lighter and mute/lower/louder frequently. Never used the other keys though like play/stop/forward. Gotta check if they work with iTunes and Youtube. Oh and there is a launchpad key? LOL. Anyway, I also never understood why people are pissed the esc key is gone since I never used it either. But I don't think that just because I don't use it nobody uses it. Oh and yeah I love Pixelmator. Support them from day one. The palette tool in the emoji bar ist a great idea. Use the right hand with the mouse and left hand for the colour while painting. Great. A shame I will never be able to use that feature since MacBook Pros are so insanely expensive now. I can't speak for Acorn or Affinity- I especially hear many great things about the latter- but for the level of graphics work I do (lightweight hobbyist), Pixelmator is a pretty-close-to-perfect blend of clean and friendly UI, capable tools, and fast performance. It's really nice to see them be on top of everything that MacOS has to offer. I love Pixelmator. One of the best apps on any platform. It keeps getting better and better without the complexity of Photoshop.